History, art and great design are featured in the Hebei Pavilion, which has become an eye-catching stop for visitors entering China's Joint Provincial Pavilion in the Expo Garden. The 600-square-meter pavilion features five interconnected geometric structures surrounded by a huge glass wall. The design is inspired by the province's traditional art of interior painting, which entails painting inside semitransparent glass or crystal objects so that people can see the picture from the outside. The building material, a green and eco-friendly glass called "Jingniuyu", is made and invented by one of Hebei's enterprises. Zhao Fenglou, director of the Expo office of the Hebei provincial government and chairman of Hebei's Council for the Promotion of International Trade, talks to China Daily. Photo by Liu Xiang. "This is a combination of modern technology and traditional ideas," said Zhao Fenglou, director of the Expo office of the Hebei provincial government and chairman of Hebei's Council for the Promotion of International Trade. One of the most valuable items in the Hebei Pavilion is a replica of the Changxin Palace Lamp. The original copy of the lamp, made in 172 BC, is stored in the Hebei Museum, but "even the replica is priceless," Zhao said. "Reproducing the lamp at will is now forbidden." The lamp has the shape of a kneeling maid holding a lantern. The smoke from the candle within it passes up through the girl's sleeve and into the hollow body, so no soot will dirty the room. "Former US secretary of state Henry Kissinger once saw the lamp, and said that the ancestors of Chinese people knew about environmental protection more than 2,000 years ago," Zhao added. The bricks of the Great Wall are another highlight. 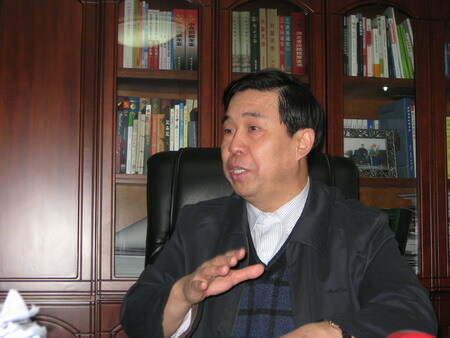 "The Great Wall ends in Hebei, and its best preserved part lies in Hebei, too," Zhao said. "We will present two bricks of the Great Wall, dating back to the Qin Dynasty (221-206 BC), on our pavilion. Visitors can touch them and feel the history." People do not have to go to Shanghai to enjoy the Expo and visit the Hebei Pavilion, the director said. They can visit Hebei's virtual pavilion online, with Web pages for all of the 11 cities of the province. Web users can see everything in the pavilion exactly as they are there. "The Expo is a platform on which we show our economy, culture, technology and achievements," said Zhao. "We want to establish a new international image as a modern and fashionable land with honest and open-minded people."